Firetail, a bay horse was bred by the Earl of Orford and foaled in 1769. 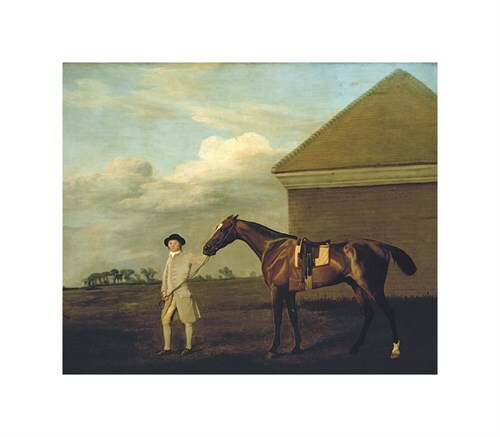 Firetail had a successful racing career during 1773-4 chiefly at Newmarket, established as the setting for this picture by the presence of the rubbing house at the start of the Beacon Courses, based on the landscape study of 1765. George Stubbs was born in 1724 in Liverpool, England and is perhaps the most important sporting artist of all time. Stubbs made his name through his remarkable capacity to portray the anatomy, muscle structure and movement of the horse. He acquired this talent after extensive travels to study the work of Renaissance Masters in Italy and his own learned researches in what he called his ‘equine pathological laboratory’, where dead horses were suspended from the ceiling for dissection. Stubbs’s enormous talents were soon recognised and he began a series of classic pictures for great patrons, mainly featuring relaxed friezes of mares and foals, hunters at grass and thoroughbreds out in the paddocks with their jockeys or stable lads. Stubbs died in 1806, classified both then and now as one of the greatest English painters of his age.